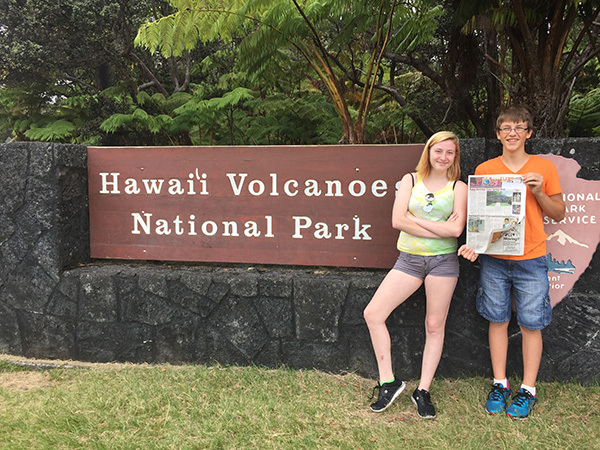 Cayden Steinebach and Emily Fishman pose in front of the Hawaii Volcanoes National Park sign with their copy of The Post. Curt and Carol Steinebach traveled with two of their children, Cayden Steinebach and Emily Fishman, to Hawaii in August and they took the Post along. They visited two of the Hawaiian islands; took a catamaran tour off the Na Pali Coast in Kauai; and also hiked some of the trails in Waimea Canyon in Kauai. They also visited Volcanoes National Park on the Big Island (Hawaii) where they were able to see an active volcano. The family had a great time traveling Hawaii with the Post for the week! Thank you to the Steinebach family for taking us with you. It sounds like you had a great time!